This years Geneva Auto Show stunned audiences with a car which teeters on the edge of an optical illusion. 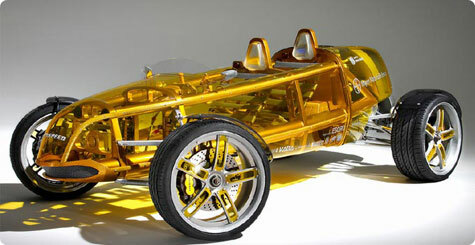 Exasis, is a transparent Rinspeed creation has an insect like body, transparent high tech plastic and yellow trim. At first glance it looks like a large scale Meccano set, upon closer inspection the image is literally transparent! Perfect for someone with a Wonder Woman fetish who wants to re-enact the invisible plane routine. How did that poor woman ever find where she parked that damn thing? We suggest adorning it with beaded seat covers ala Taxi Drvier style to help it stand out in the crowd.